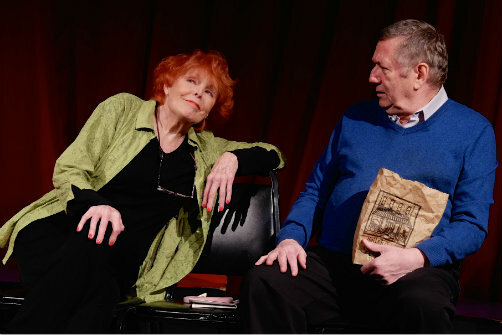 Marie Wallace and James Nugent in "A New York Encounter" from Look Me in the Eyes. Photo by Michele Becker. BOTTOM LINE: An evening of short plays about relationships, performed by a multigenerational ensemble of actors. A program of short plays about relationships is to be expected from actors in their twenties, newly migrated to New York with their freshly earned theatre degrees. But what makes this show unique is the mission of the American Renaissance Theater Company: to develop “new works by a multigenerational company of professional playwrights, actors and directors.” Included are a few vignettes of younger characters struggling with their relationships, but less typical, and therefore more interesting, are the plays about people in their sixties and seventies navigating their love lives. The show is bookended by the titular piece, written by Margo Hammond and directed by Elowyn Castle, about a middle-aged husband (James Rutledge) who is freaking out about the fact that his wife (Kathleen Swan) doesn’t really see him when she looks into his eyes. The play that stands out the most is A New York Encounter, written by Fran Handman and also directed by Castle, which presents an older man’s (James Nugent) attempt to pick up a woman of his own age (Marie Wallace), whom he just met on a park bench. He invites her back to his apartment for an afternoon of wine sipping and face sucking. He refers to her as "annoying" before going in for the kill, so no one imagines this will be the genesis of a long term romance. But it was eye opening to see that such an attitude did not preclude him from sleeping with her (I guess that’s what random hookups in your seventies look like).Still, the younger actors win for the most entertaining piece: in Triple Play by Marc Castle, directed by Bill Cosgriff, Lynda (Alexandra Curran) introduces her new boyfriend David (Daniel Kirby) to her best friend Allie (Megan Greener). Allie and David pretend not to know each other even though they are former lovers. The other plays include The Art of Escape, written and directed by Cosgriff, in which Matt (Daniel Kirby) and his girlfriend Jane (Megan Greener) argue about the future of their relationship after he informs her that he has just quit his job and plans to move to California. Next is Stamina by Donna Kaz and directed by Kathleen Swan, about two women (Catharine Boyd and Judy Frank) who attempt to become the oldest ever to summit Everest. (Maybe I’ve watched one too many disaster movies, but my impression has always been that you either summit Everest or you don’t, but stopping to talk about it on the way could make the difference between success and death.) Finally, in Time with Harold and Hal, written by Stuart D’Ver and directed by Castle, two men (Nugent and Rutledge again) living in a retirement community argue about expletives derived from animal dung and which of them will check the mailbox. Each short play is separated by readings from “Love Poems” by Linda Kampley, but these interludes don’t add enough to justify their disruption of momentum. As evenings of short plays go, this one is interesting and entertaining enough. And as someone once said about short play festivals, if you don’t like one of the plays, just wait ten minutes. Look Me in the Eyes is by Marc Castle, Bill Cosgriff, Stuart D'Ver, Margo Hammond, Fran Handman, Donna Kaz, and Linda Kampley. Directed by Elowyn Castle, Bill Cosgriff, and Kathleen Swan. Lighting Design and Scenic Consultation is by Leah Cohen. Stage Manager is Whitney Dearden. The cast is Catharine Boyd, Alexandra Curran, Judy Frank, Megan Greener, Daniel Kirby, James Nugent, James Rutledge, Kathleen Swan, and Marie Wallace.